Sanucubic Pro: Equipped with 2 powerful motors with macerators, SANICUBIC Pro can pump away the waste water from several appliances: WC, shower, bath, washing machine, dishwasher, and so on. This smart unit with its multiple inlets in different diameters and double alarm (one on the unit and another remote) provides a high level of security and performances.It has been specially designed for intensive use. 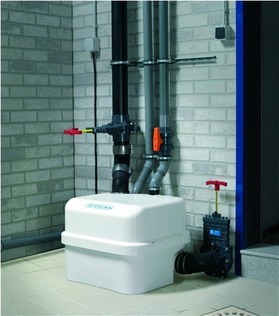 A new lift station to flush away all the waste waters from a complete house! 2 x 1500W. High performance macerating pump that discharges waste and water from multiple WCs and other appliances. Macerator with connections to WC/washbasins etc. 3000W. H x W x D: 400 x 557 x 492mm. EN 12050-1.